Gaslighting: New Trend in Home Decor, or Mental Manipulation? If you answered new trend in home decor, you're about a century out of date. Gaslighting is a form of emotional manipulation. It is a way of telling people, especially women, that their opinions and perceptions are out of whack with "reality." Out of whack with the reality that the manipulator wants to believe, that is. For a clear and articulate recent article on this topic, read Yashar Ali's piece in The New Agenda: http://www.thenewagenda.net/2011/09/17/a-message-to-women-from-a-man-you-are-not-%E2%80%9Ccrazy%E2%80%9D/comment-page-1/#comment-76411. Read the article to find out how "gaslighting" got its name. Whenever anyone tells you that you are "over-reacting," "too sensitive," "too emotional," or "I was just joking, don't you have a sense of humor" (and there are infinitely more variations), they are minimizing and discounting your feelings and perceptions. This is substantially different from someone saying to you, "Wow, I have a totally different understanding of this!" Both may be ways of expressing disagreement, but the former is an aggressive way of denying that your perspective is valid. Sometimes the person doing the gaslighting is feeling defensive because they don't care to be "wrong." Other times, if the person does it on a regular basis, it is plain abuse. Once seen for what it is, it's simple. Until then, it's crazy-making. In today's self-defense class, we talked about how body language can be used to try and intimidate and invalidate others in a work environment. How to clearly recognize it, and how to use your own body language to minimize its effect on you. How to tell someone, "hey, you're discounting my opinion, quit it!" And your options, in case they don't. Q. If you can have one super power, what would it be? Bird: Probably be invisible. People always want to be a fly on the wall. I could just stay in my form and just be invisible. What would be your super power, if you could be a super-shero? Read the Weekly article for yourself. 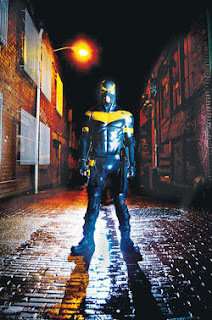 A few months ago The Seattle Weekly published an article on "Phoenix Jones" and his group of Rain City Superheros. Jones, the group's de facto spokesman, calls himself the "Guardian of Seattle." His goal is to keep us all safe by fighting crime in a superhero costume. Just like in the comics. So, according to this article, he and his cohorts roam around Pioneer Square and Belltown as the 2:00 closing hour approaches, helping the party-hardy stay out of fights. Jones seems aware that his costumed approach, while garnering press today, will eventually wear thin. "The goal is for the people to be inspired by what I do. The goal is to inspire people to not put up with petty crimes." So there is some discussion about whether or not he actually does help solve crimes, or keep our streets safer, or is he a total wack job running around in a rubber suit. That's not the discussion I'm interested in. While Jones and his colleagues are roaming around downtown city streets, most assaults against women are committed in their homes, or in someone else's home. Where Jones and his cadre of superheros are not. All the superheros on the streets will not protect you against the abusive boyfriend in the bedroom. So, at times, many of us will have to be our own superheros. If you were to be a superhero, who would you be? What would be your super power? Who are you sworn to protect? I've been asking students in my self-defense classes that very question. Let me know. Evil-doers need not apply.